"Las calles son del chavismo!" ("The streets belong to the chavistas!") has long been the claim made by Venezuelan supporters of Hugo Chavez and his successor, "son of Chavez" President Nicolas Maduro. It's a hashtag on the Venezuela government's social media accounts and a slogan painted on walls in the capital Caracas. But already this year, three huge mobilizations of opposition supporters have shown the government is no longer able to sustain that claim, at least when it comes to peaceful protests. Although details of Tuesday's opposition protests were kept under wraps until the day before, everyone in the country is aware that the day will be a major test of strength between the two men who claim to be Venezuela's legitimate president, Maduro and opposition leader Juan Guaido. Will the opposition be able to maintain the momentum of a movement that has seen enormous human rivers, hundreds of thousands strong, pour into the avenues of Caracas? Will the government react as it did on Jan. 23, with gunfire and mass arrests, or will it behave as it did the week after, when police stood back and arrested almost nobody? Early signs on Tuesday morning suggested a heavier police presence than on Jan. 30 on the streets of Caracas, with more heavy weapons in view. 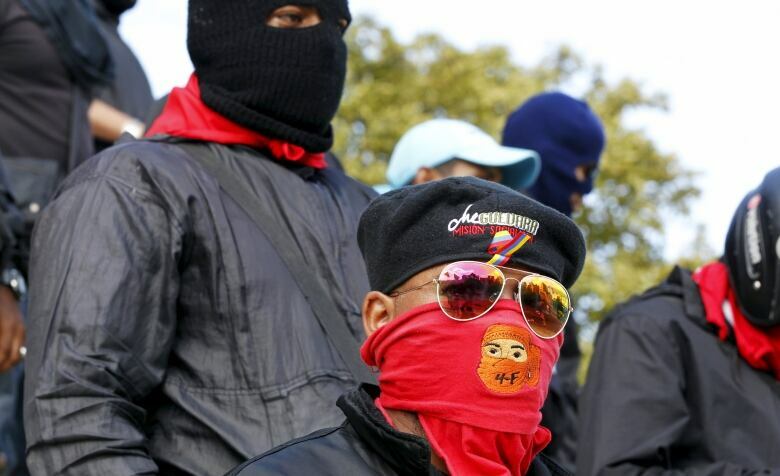 The real test of the government's intentions, though, may be the presence of gangs known as colectivos, armed by the Socialist Party, who often attack opposition demonstrators from motorcycles. They have been responsible for many of the fatal shootings at past demonstrations. Over the past week, the Maduro government has repeatedly called on its local cadres to stage a series of rallies around the country intended to show that it still has mass support. Maduro's No. 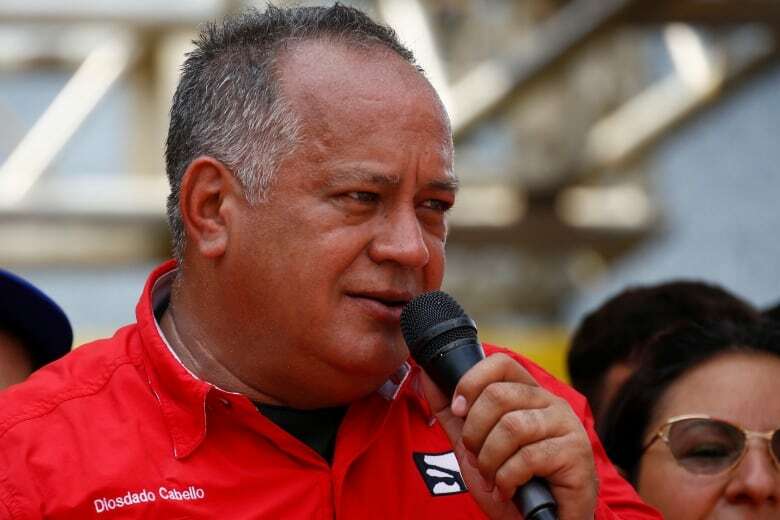 2, Diosdado Cabello — the most visible face of the government on television along with Maduro himself — has led red-shirted crowds in the states of Tachira and Aragua. 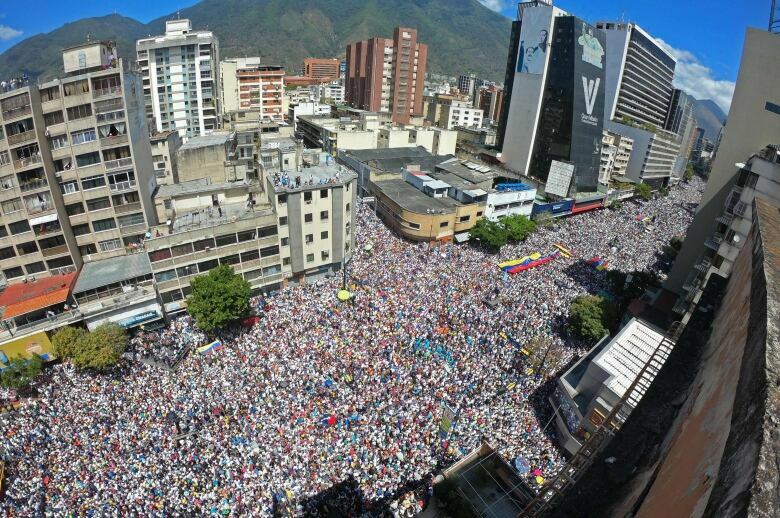 But despite what opposition members describe as aggressive Photoshopping of pictures, the government hasn't been able to pull off anything like the multitudinous marches that spread from horizon to horizon in support of Guaido, who is considered the legitimate acting president under the Venezuelan constitution by the opposition (and by most of Latin America, North America and Europe). 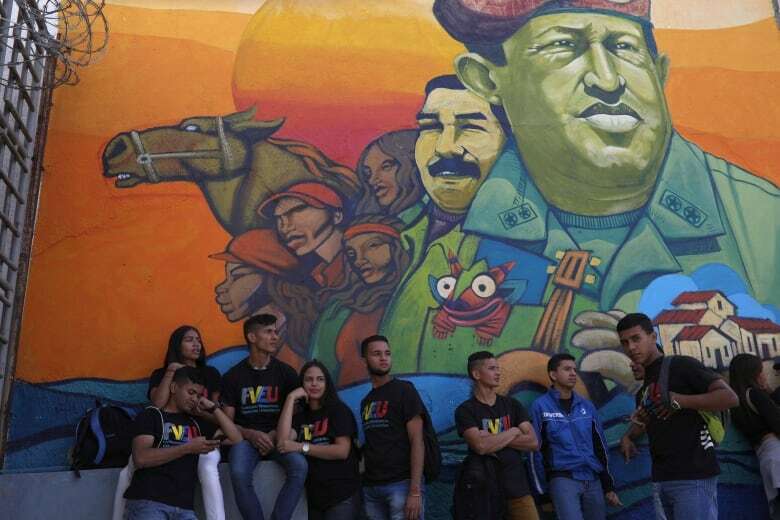 Maduro divided his day Monday between the Angostura 2019 military exercises and the somewhat bizarre launch of a government effort to rebrand Venezuela ("Marca Pais: Venezuela Open to the Future") and attract tourists to the country. "It's a good opportunity, while Venezuela is in the eye of a geopolitical hurricane, " he said at a ceremony attended by many of the luminaries of Maduro's United Socialist Party, "that when the news programs of the world begin their shows with our country, not to say with lies about Venezuela, when the world's press devote entire pages to Venezuela, when social networks boil with news about our country." It's not clear where tourists would come from. Probably not many will venture from Canada, which last week raised the travel warning for Venezuela to the same level as Syria's. Maduro also appeared with the armed forces, as he has almost every day since the current wave of protests began. The exercises focused on training party militias, just recently incorporated into the armed forces on Maduro's orders, to work alongside the army and use heavier weapons such as rocket-propelled grenades. The arming of party militias to defend the government's hold on power has been intense since Guaido assumed the acting presidency in mid-January. In today's Venezuela, most of the population depends in some way or another on the government, and the government has never hesitated to use that as leverage to coerce people to attend its rallies or vote for it. Six million Venezuelan households representing a majority of the country's population receive a monthly bag or box of subsidized food known as the CLAP, an acronym for the local Socialist Party committees that administer its distribution. Though Venezuelans mostly despise the CLAP system, many fear losing it and being unable to feed their families. The handouts are sometimes linked to participation in pro-government displays of loyalty, one public sector worker told CBC News. "If you don't go, we'll fire you," the civil servant said, describing what employers tell their workers. "Or 'Let's go, so they can give you the box. That's where you're going to receive the subsidy.'" 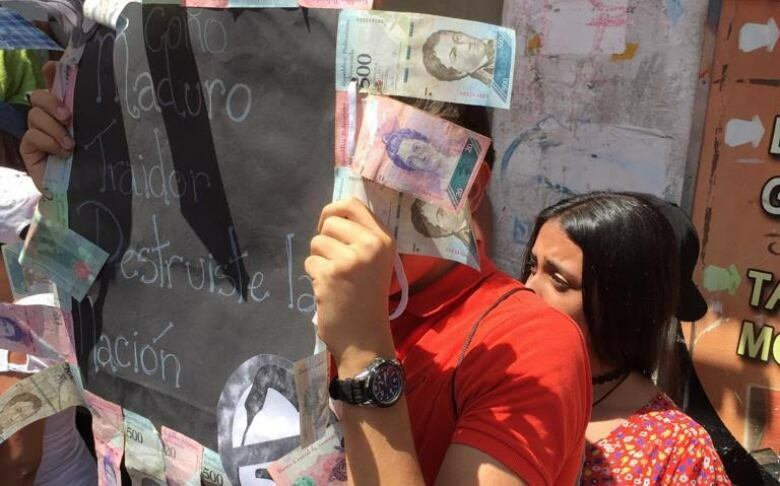 But as discontent has intensified, and the CLAP itself has diminished in content (though not in price), Venezuelans are proving less susceptible to pressure to trade sham loyalty for a meal. There's been a similar weakening of the other main lever of coercion the government holds over people: their dependence on public sector jobs. Adriana (not her real name) is a systems engineer at the state telephone company, CANTV. She prefers to remain anonymous out of fear of reprisals against family members. "They always force employees to go to the marches, and to sign things," she said. "They make lists of people. This happens throughout the public administration. They make lists of who has to attend the marches, and quite simply, the people who don't support that type of thing are dead to the company. They never get promotions, and they never get raises." Adriana has taken a momentous decision as the Maduro government uses all the levers of coercion it has in an effort to collect 10 million signatures for a "#HandsOffVenezuela" petition to be delivered, says the government, to the people of the United States. "I know that any moment now, they're going to come to me to sign it," Adriana said. "My position is: I'm not signing that thing. My values count for more than the job." Adriana says she expects to be dismissed in the coming days. Just as the CLAP boxes have been shrinking, hyperinflation is rapidly reducing Adriana's wages to nothing anyway, she says. "I now spend a lot of time doing other things because the monthly salary isn't even enough to buy a carton of eggs." Adriana says she has watched the company she works for decline under the control of its Maduro-appointed director Manuel Fernandez. "It's been nothing but change for the worse, both in terms of the company itself and the treatment of its employees." 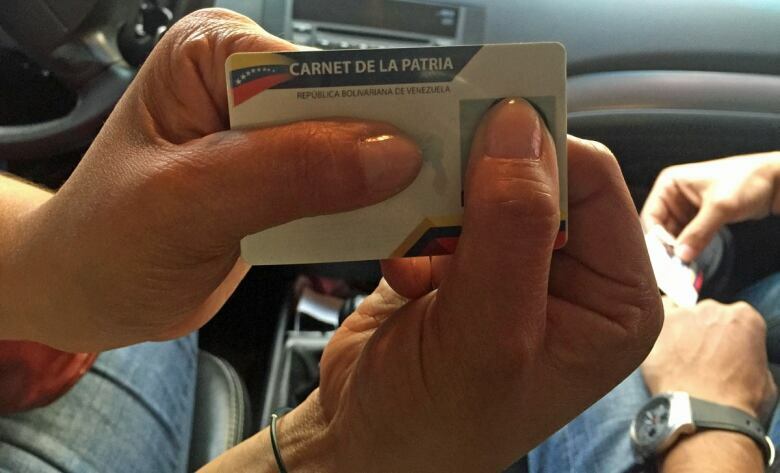 Adriana says she was particularly upset when the company enrolled her for Venezuela's new Carnet de la Patria, or Fatherland Card, a digitized ID card that Venezuelans now need to access hospitals, receive subsidies or even buy gasoline. She says the company simply used the photo from her company ID for the Fatherland Card without asking her permission. Many Venezuelans see the cards, designed with help from the Chinese government, as a tool of totalitarian control. She says it's hard to feel pride in working for the company under present conditions. "All the infrastructure is in terrible shape, because people steal the cables for the copper," she said. "Ninety per cent of Venezuela's cables are copper, and I'd say between 80 per cent and 90 per cent of them are affected. The infrastructure hasn't been maintained, because they won't put in any money. "When the line goes dead, people continue to pay their bills, so they don't lose their home connection altogether, and there are people who've been paying their bills for years without any service, voice, internet, nothing, just so they won't lose their line. There is no way to repair the breakdowns." She also says, like so many Venezuelans CBC News has spoken to, that she feels a change is coming. "I have a lot of faith that the end is near. I have a lot of faith that this new guy, Juan Guaido, will do what has to be done, and get in front of this situation. "Venezuelans are hard-working people, and we're going to lift this country up again, even if we have to do it from zero, which is where they've left it."